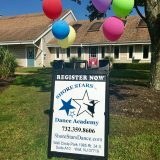 Shore Stars Dance Academy will be open every Tuesday and Thursday in August 2018 from 6:30pm to 8:00pm. Stop by to tour the dance studio, register for any of our children’s dance classes, or get fitted for your dance attire and shoes. Hope to see you soon! Shore Stars will be closed for Spring Break on March 30th through April 6th. We re-open for classes on Saturday, April 7, 2018. Our "Sister Stars" program is where we pair up our younger dancers with our older dancers. We will have "Sister Stars" meetings where the dance sisters can get to know each other better. NEW Yoga classes begin Wednesday, March 8, 2017! Visit https://www.twistedsisteryogallc.com/ for more information or to sign up! Where dancing and having fun is a shore thing! Your child will grow in confidence, learn new things, and challenge themselves all while being supported and encouraged by nurturing, experienced, and energetic teachers. Copyright © 2017 Shore Stars Dance Academy. All rights reserved.